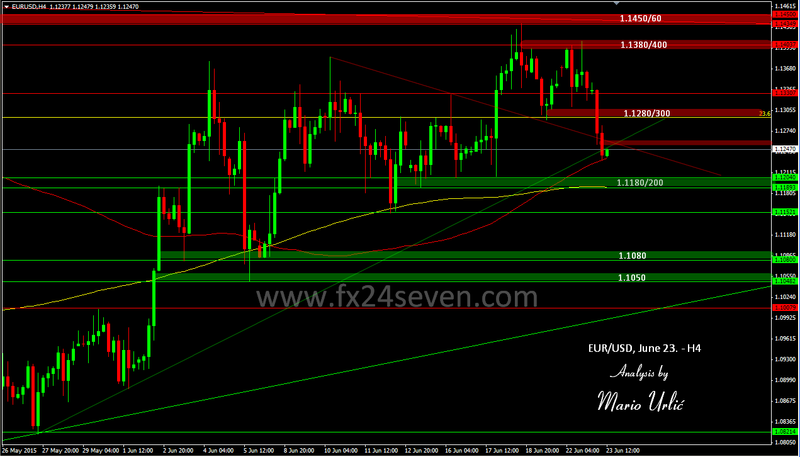 EUR/USD, H4 MA100 has stoped the fall! At least for now, the pair is looking extremely bearish. 1.1180/200 could be the next target for the bears, H4/MA 200 is placed at 1.1190, follows 1.1150, the previous support from June 05. EUR/USD has broke two trend lines in this latest decline, 23.6 fibo as well in the morning. Could the pair recover from this level? Technicaly, the pair is oversold, but on the other side there is several resistance areas now on the way up. While the Greek news are driving the market, it’s hard to analyse the euro, the levels could be broken and recovered easy, but the stronger levels could ‘work’. On the way down 1.1180/200 > 1.1150 is the stronger support, on the way up first resistance is 1.1250/60, follows 1.1280/300. I agree, the price action is looking very bearish. Looking at the weekly charts, the last four weeks have been bullish with higher highs and higher lows. The big question is whether the price action will break last weeks low which comes in at 1.11889. If it does that might indicate a change in trend with there being lower lows and lower highs on the weekly chart. There has been an attempt which was unsuccessful to break last weeks high. If neither last weeks high or low is broken then it will be an inside week which means that there is no change in the bullish trend. However last weeks low does look very vulnerable. Goldman Sacs have an interesting explanation for the bullish movement of the EUR/USD namely that the market have been trading the lack of conviction by the Bundesbank in the ECB’s QE programme rather than a potential Greek default. The explanation certainly makes a lot of sense. If Greece does default and Grexit becomes a reality, the market may start to view the Euro as being merely a pegged currency with members being allowed to enter and exit at will. If that becomes the case, I don’t think that anything Super Mario might say will be able to save the Euro and it could be the beginning of the end. Such events would be a complete tragedy with everything that has been achieved over the last seventy years lost in just a few days. There has been peace in Europe (Yugoslavia excluded) for seventy years which is the longest period in history. The Cold War does not really count as it was not really a war in which people were killed as such. The other thing is that Grexit would set a precedent for the UK’s departure from the European Union which is something I strongly support. However I would not support it at the cost of the breakup of the European Union as a whole. Interesting and somewhat worrying times ahead. There is no doubt that the leaders of Greece are playing with fire. Every way forward for them is fraught with consequences From there prospective the only way for them really to return to growth is by readopting the Drachma with massive devaluation. However if that course were to be followed the devastating consequences outline above would in my opinion almost certainly will occur. Thus from a fundamental point of view I am changing from being a Euro bull and becoming a Euro bear. From a technical prospective a break of last weeks low will almost certainly be the precipitating factor to confirm the resumption of a short trend.